Dr Iwan R Dietschi the intensely cerebral general manager of The Ritz-Carlton Shenzhen on his hospitality style, his single-minded focus on the guest experience, and life in what he describes as a "feel good" business. Watching the tall, immaculately dressed Dr Iwan R Dietschi pace a room is like looking at a stalking panther singularly focused on its prey. Elegant to a fault, with long hair swept back – not a strand out of place – and trimmed just above the high collar, his gaze is intense, the slim-line charcoal suit rippling with energy and set off by a slim blue patterned tie, and a crisp pocket square emblazoned across the coat breast. He is a cerebral hotelier - the 'Dr' says it all - with a deep emotional reservoir. He is watchful and attentive with guests and directs his staff with a gesture or a glance like an intuitive orchestra conductor. Smart Travel Asia Editor Vijay Verghese spoke with him on a brilliant Autumn morning at The Ritz-Carlton Shenzhen where he is both General Manager as well as a multi-property VP. 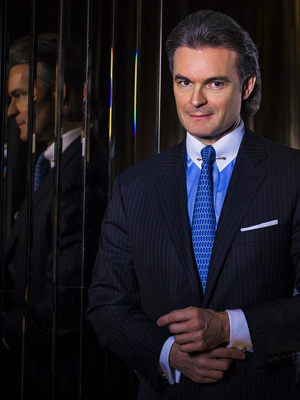 Having graduated from the Lausanne Hotel School, Swiss-born Iwan joined Ritz-Carlton in 1995 in Washington DC and has since worked on 18 hotel openings for the group. Smart Travel Asia: How did your early interest in hotels develop? IWAN DIETSCHI: I grew up next to a hotel and the children of the owners were my best friends. We all played together and spent a lot of time in and around the hotel. One of my uncles owned a nice hotel in Lugano, Switzerland as well and he introduced me to the life of a hotelier early on. I always remember the first time I saw him in his hotel, wearing a coat with six gold buttons: I thought, I want to be a gentleman like him. So you started with hotels? IWAN DIETSCHI: In my earlier years, I thought about becoming a musician as I started to play an instrument at the age of four. Then at seven, I learned how to play the trumpet and became very passionate about music, which I studied in the US when I was 19. My idol was Louis Armstrong. I played all his songs. However, I decided to become a hotelier as I felt it was more suitable for me. I was always passionate about people and making others feel good about themselves, enjoyed the elegance of a hotel, and to be a true host to others. ID: It was at the front desk of a small hotel that belonged to a family friend. There were no computers in those days and everything was done manually. It was a proud profession then. ID: In general, all guests still want to feel “at home”, special, and recognised in their own way. Guest evolution needs to be looked at in a positive way as we all need to learn and evolve around changing customer expectations. Some people may be more private and don’t need too many people around them – but they know we are here to take care of them. Everyone wants the basics done right and they expect proactive service. How do millennials impact on your operation? ID: Employees have never been as excited as today to learn. They are like hungry little birds. They have to be “fed” through knowledge and by competent leaders who have only the best in mind for them [pauses for a moment]. They want to know; they want to learn. It is important for a general manager to be a coach, a mentor, and to aspire to become a role model. We have to engage with our employees to inspire them, guide and retain them. ID: It is true that some might not wish a lot of attention and seem to be aloof at times, but they need to feel that employees are there to assist at any time. They expect employees to be competent, fast, and always with a smile on their faces. They challenge us to become better professionals. Every guest is unique and that is a challenge but very exciting. ID: To feel good in your heart and mind. It is peace and joy that creates happiness and oftentimes it is the little things that can bring sunshine to my heart. As TRUE hoteliers we are in the ‘feel good’ business. That’s what a HOST [emphasises the point with his hands] does and that is how I try to live every day. How do you woo and keep luxury travellers? ID: There have never been more billionaires/millionaires than now. They are challenging us in many positive ways. To provide excellence at a consistent level is crucial in our business, every business! Excellence is created by consistent focus on improvement, service and product delivery. As leaders we need to live by example and mentor our employees to the next level. How do you reconcile the conflicting pulls of revenue demands from the top and guest needs? ID: Excellence has to be created and strengthened from within. We need to focus on our foundation first and remind ourselves why we come to work every day. Guests will remember experiences. The best recognition for any business is repeat customers, willing to pay a higher price because employees create unmatched experiences throughout. True loyalty is created through touching hearts, unique experiences, and by personalising stays based on needs and wishes of the guests. Are their many women in your team? ID: I am thrilled to work with so many dedicated ladies in our hotel and in our organization. The executive team is well-balanced and it is a joy and privilege to learn and work with our female leaders. It also reflects the changing composition of our guests with particular needs, demands, and expectations. How do you deal with fake reviews or social media pressure? ID: First, we can never assume anything is fake. We have to look at every single bit of feedback, take it very seriously, and learn from it. Every single guest is a top priority and it is up to us to engage with everyone. We never lose a guest, and this critical aspect helps us to create memories for everyone. Are there too many brands today? ID: The market will make the determination if there are too many brands or not. It is always important to give a customer choice and as long as the brands are focused on their true vision and mission and execute based on their promise to guests and employees, they will have a solid chance to survive in an ever-growing business environment. At the end of the day the customer decides whether a brand succeeds [with a shrug of the shoulders and upturned palms] – or not. ID: I have a balanced life, and I want to make the industry better. I want to inspire employees. That’s my goal. I am doing my best on a daily basis through my job to demonstrate the value and beauty of being an hotelier.